Weddings at Alyson’s take place in some of the most beautiful settings that you could ever imagine. There are five distinct ceremony sites to choose from, each with a unique view of the orchard. Choose a wedding site with views of the picturesque town of Walpole, the Connecticut River Valley or a serene spot by one of our spring-fed ponds. 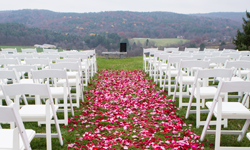 Alyson’s is well-known for hosting some of the best destination weddings in New England. Bring your family and friends and stay for the weekend…or the week. At Alyson’s we believe that one of the most important days of your life doesn’t have to last just one day! With horseshoe pits, bocce ball, fresh water ponds for swimming and fishing, apples for picking and lots of open space for a variety of activities, a wedding at Alyson’s is an unforgettable, unique experience that you and your guests will enjoy and remember, and talk about for years to come. With three unique, welcoming lodging facilities, a reception hall for up to 250 guests, and over 25 years of experience in the wedding industry, Alyson’s Orchard is renowned as one of New England’s finest destination wedding sites. Alyson’s has great relationships with local caterers, photographers, florists and musicians and our Event Manager is more than happy to help make the wedding of your dreams become a reality, offering advice and guidance as needed. 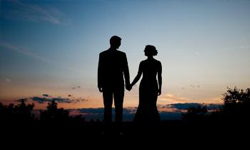 Come get married at Alyson’s and take advantage of our spectacular wedding facilities, hundreds of acres of rolling fields, spring-fed ponds and comfortable lodging. Come see why Alyson’s is the place in New England to be married. Whether you choose a destination wedding, a mid-week wedding or a Sunday sunset wedding, we will help you create beautiful memories to last a lifetime. We would love to meet you and learn about your wedding plans. 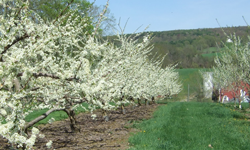 Come to Alyson’s Orchard and tour the facilities and grounds. Call us toll-free at 800-856-0549 to set up an appointment today. 07.20.13 Emily + Evan Sneak Peek from nh images on Vimeo. Emily & Evan Sneak Peek from NH Images.